CFIE INVESTMENT LIMITED +18.00 Received Payment 18.00 USD from account U18301495. Memo: API Payment. Withdraw to FairMonitor from www.cfie.biz. CFIE INVESTMENT LIMITED +24.3 Received Payment 24.3 USD from account U18301495. Memo: API Payment. Withdraw to FairMonitor from www.cfie.biz. 3.09.18 07:10;Account;Receive;Received Payment 5.5 USD from account U18301495 to account U1294000. Batch: 228178757. Memo: API Payment. Withdraw to all-hyips.info from www.cfie.biz. CFIE INVESTMENT LIMITED +13.00 Received Payment 13.00 USD from account U18301495. Memo: API Payment. Withdraw to FairMonitor from www.cfie.biz. CFIE INVESTMENT LIMITED +4.5 Received Payment 4.5 USD from account U18301495. Memo: API Payment. Withdraw to FairMonitor from www.cfie.biz. CFIE INVESTMENT LIMITED +18.5 Received Payment 18.5 USD from account U18301495. Memo: API Payment. Withdraw to FairMonitor from www.cfie.biz. CFIE INVESTMENT LIMITED +6.75 Received Payment 6.75 USD from account U18301495. Memo: API Payment. Withdraw to FairMonitor from www.cfie.biz. CFIE INVESTMENT LIMITED +10.5 Received Payment 10.5 USD from account U18301495. Memo: API Payment. Withdraw to FairMonitor from www.cfie.biz. .09.18 19:34;Account;Receive;Received Payment 5.5 USD from account U18301495 to account U1294000. Batch: 229196814. Memo: API Payment. 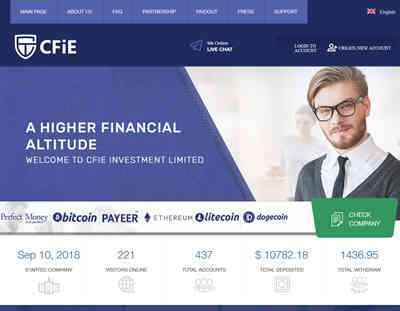 Withdraw to all-hyips.info from www.cfie.biz. CFIE INVESTMENT LIMITED +10.75 Received Payment 10.75 USD from account U18301495. Memo: API Payment. Withdraw to FairMonitor from www.cfie.biz. CFIE INVESTMENT LIMITED +15.5 Received Payment 15.5 USD from account U18301495. Memo: API Payment. Withdraw to FairMonitor from www.cfie.biz.